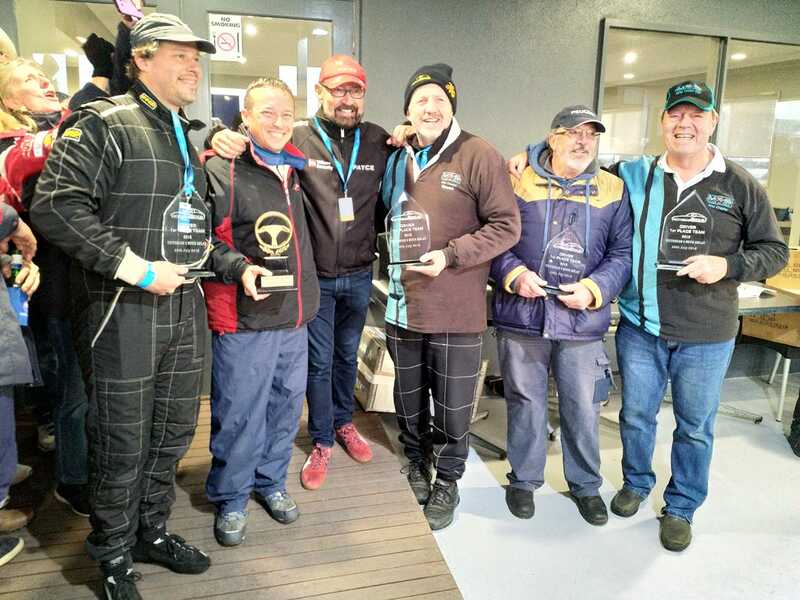 It's been a very long time coming but we've finally done it: the Panorama Mountain Men claimed the WIN at the 2018 Phillip Island 6 Hour Regularity Relay. Since our club fielded it's first team at this prestigious L2S event in 2011, we've had three second-places (2012, 2015, 2016). But never the top step. Winners are grinners! I was the Team Manager of the Panorama Mountain Men in addition to being the fourth driver, although I'd only drive a 30 minute stint in practice and the relay. Stewart, Gus and Glenn had all previously been on teams that had finished second at this event, and the four of us had won the Alfa 12 Hour at Winton in October 2017. We had a very strong team that was there to win it, and the guys spent countless hours debating strategies. 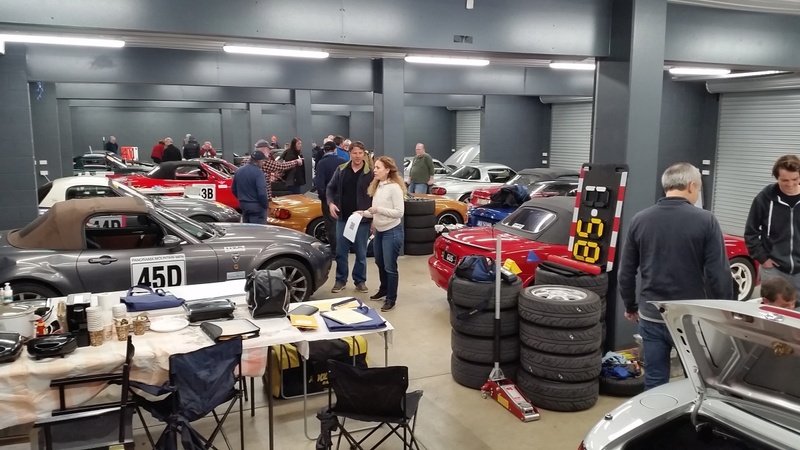 However, we were also very short of pit crew support, and there was no rest while the event was underway. At one point on Sunday while stopwatch timing our driver's laps, I finished timing one lap, then dashed to the toilet for a "pit-stop", and made it back to capture his next lap time. Now that's commitment! Practice on Saturday was held in glorious weather, with clear blue skies and no wind to speak of. 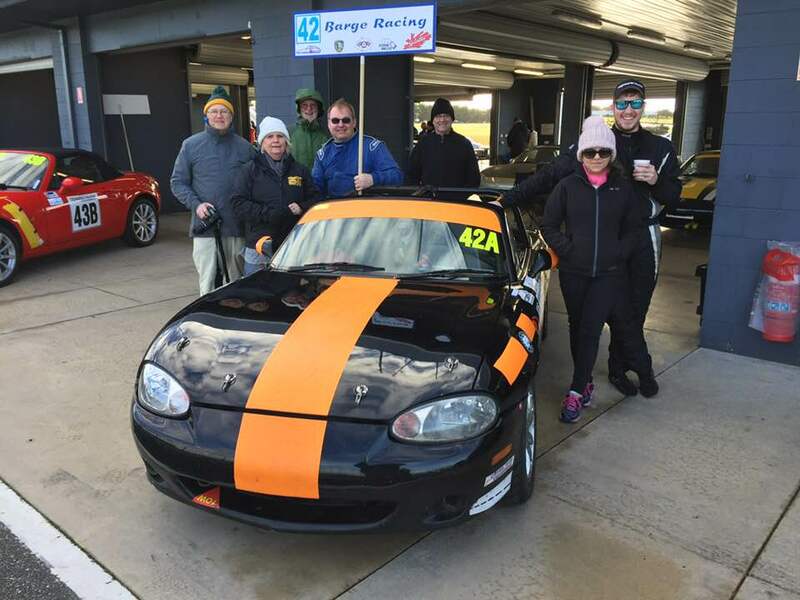 All four drivers in TEAMX5 NB had never driven at Phillip Island before, let alone at the 6 Hour Relay. They took full advantage of the "newbies" session at the start, with our experienced drivers guiding them from the passenger seat. Then practice properly got under way. The day went smoothly for all our teams with one notable exception. 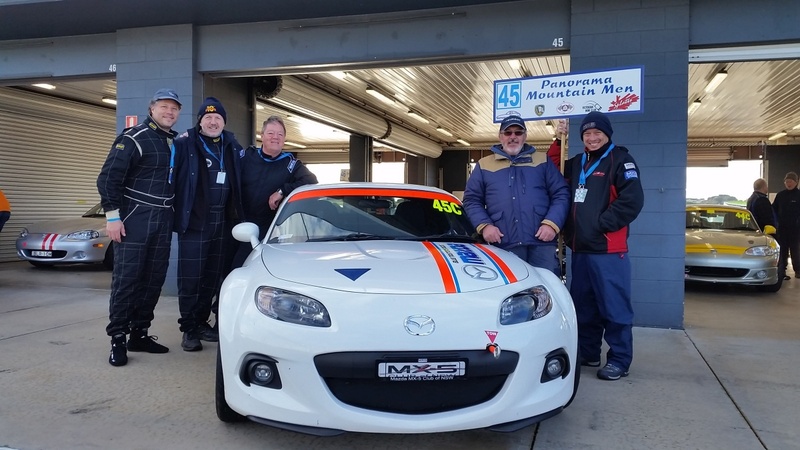 John Karayannis returned to the pits with a leaking power steering hose, which was quickly repaired with the help of a few MX-5ers. 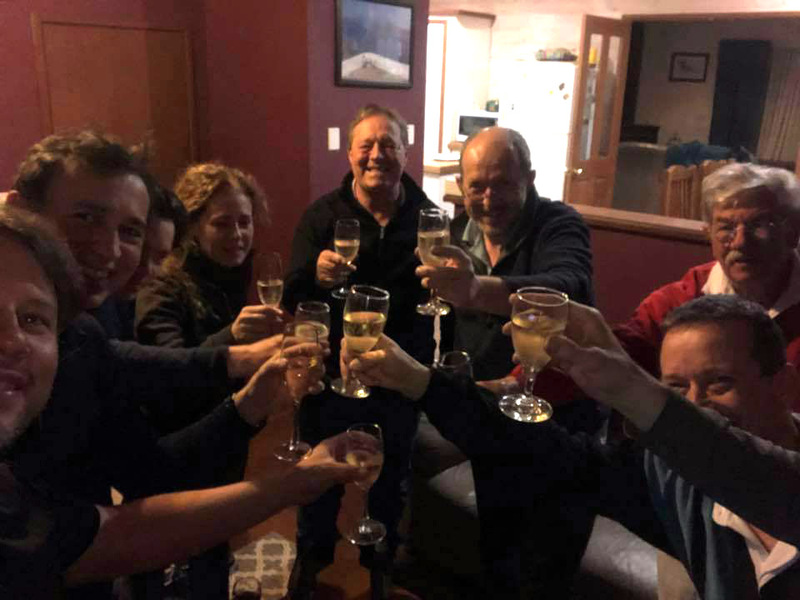 Our regularity times were nominated and we returned to our various lodgings for dinner and a night's rest. Evenings spent together with our teams is always a great highlight of these events. The weather forecast for Sunday was terrible, with almost guaranteed rain and a thunderstorm. We were permitted to alter our nominated times, which prompted nervous conversations, detailed strategising and heated debate. I decided that our team would stick with our nominated times for a dry track, as that would ensure we'd not break out and ruin our chances. Regularity driving to a wet laptime is next to impossible, as other teams had found in the past. It proved to be a crucially correct decision as the rain didn't arrive until mid afternoon. 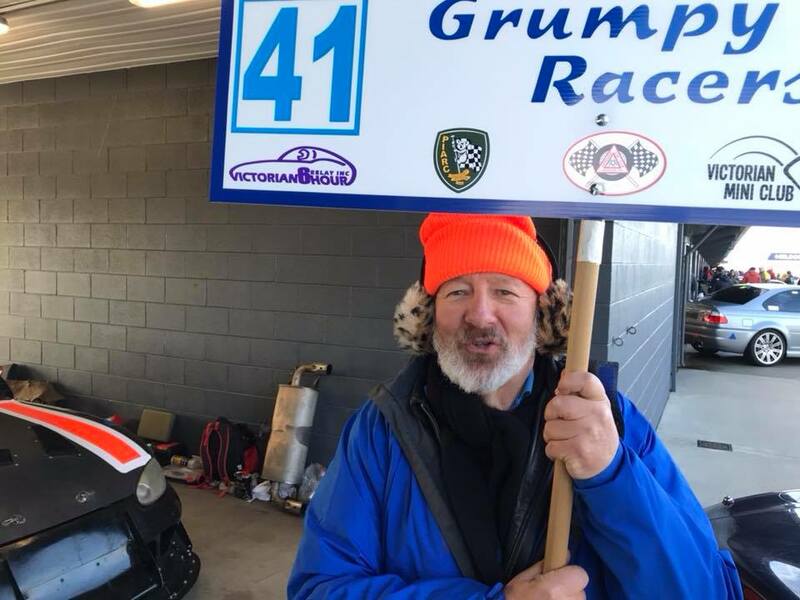 Three of our teams were effectively out of contention before the 6 Hour started: TEAMX5 NB, TEAMX5 Hunter and Grumpy Old Racers. They carried over penalties from the Saturday for flag infringements. The scoring system necessitates that all penalities must be avoided, so they were now just there to experience the event. One hour in, Just Regular Guys were in third place, Panorama Mountain Men were 9th and Barge Racing were 24th. By the two hour mark, Panorama Mountain Men had climbed to first thanks to a healthy haul of bonus laps, while Just Regular Guys were 4th. Barge Racing struggled to score bonuses and incurred a penalty lap, which left them 26th (finished 22nd). At the half way point, Panorama Mountain Men were still in first, in a tight battle with a neighbouring team of Mustangs, and Just Regular Guys were third. Unfortunately, "The Guys" were soon after penalised for leaving a driver circulating one lap too many. It was a tiny mistake that ultimately and cruelly cost them second place - they were 5th at the end. Meanwhile, luck was on the side of Panorama Mountain Men whose nearest rivals fell away as they received penalties. Our battle with the Mustangs ended at the 4 hour mark with them getting a penalty. Rain arrived at the 4.5 hour mark, and the PIARC-Scarcella team were knocked out by a few more penalties. With one hour left, we had an unassailable lead and only a mistake would lose it for us. Gus finished it off for us with an easy cruise to the end, keeping a very close eye out for yellow flags. Job done! All that was left was the presentation and it was brilliant to receive the trophies from legendary driver John Bowe.